Also known as Cloudpenz, Cloud Pen is a company that specializes in portable vaporizers and vape accessories. Their engineers have created a variety of vape pens, some of which have been collaborations with famous celebrities. The designs are highly unique and beautiful, ranging from tasteful art to multi-colored options. As varied as their vaporizers are, they offer an equally diverse selection of atomizers to allow you the best and most customizable experience you can get. Cloud Pen brand also offers accessories such as attachments, replacement batteries, mouthpieces, and much more. Cloud Pen is a Los Angeles-based company founded by its CEO Brett Albanese in 2012 and has swiftly made its name in the vaping industry as one of the most influential companies around. Not only is it a company founded on its passion for creating exceptional vapes and accessories, they offer a robust line of powerful vaporizers that has helped secure brand's notable position in the world of vaping. Staying ahead of the trends, Cloud Pen relies on their innovative new technologies to keep them ahead of the game. So, if you're unique, have your own sense of style, personality and you love to vape! The Cloud Pen Vaporizer collection is for you, because it's every bit as unique as you are and guaranteed to deliver vaping satisfaction to help you fully enjoy your favorite waxy concentrates or dry herbs on the go. All of the Cloud Pen vapes are made to be a very compact, so that you can carry any of the models easily anywhere. At the same time, ultra stylish, so you can show off your individuality whenever you're savoring vapor. This brand consistently introduces new color options and patterns as well, making some of the models available only for a limited time. These vape pens are so popular that many vape enthusiasts own two, three, and even more, so they can carry different colors and patterns to match their mood or complement their sense of style. The Cloud Pen line is a well-loved collection of portable vaporizers, offering its users a chance to enjoy the best of the best when it comes to dabbing and vaping on the go at an affordable price. Small, compact, and easy to hold in your hand or pocket, any Cloud Pen device can be your new favorite way to vape concentrates and/or dry herbs. They are simple to charge via USB in the car or at home so you are never without your handheld vaporizer. Unlike other models that barely last through one session, Cloud Pen wax and dry herb vaporizers have lithium ion batteries that help power through multiple sessions. Even when compared to previous discontinued versions of the CloudPen kits, the batteries in the latest pen vapes listed above, last at least 50% longer! Scroll down, to learn about this brand's complete line of products and all of their features. The Cloud Pen 1.0 is the 2nd edition of the original Cloud Pen vaporizer. It uses the power of a 350 mAh battery to provide great vapor after only 5-seconds to heat its single coil rod atomizer to the perfect temperature for dabbing. This atomizer is also an open design that lets you load your concentrates quickly and efficiently. The Cloud Pen 1.0 is ultra sleek and compact with its beautiful matte black finish, making it perfect for taking on trips and adventures as your stealthy little companion. Its size will allow you to hold Cloud Pen 1.0 almost completely in your palm when you take a draw, and it slides into your pocket with great ease. The Cloud Pen 1.0 wax pen uses a 15-second draw time, allowing you to draw the most vapor possible. 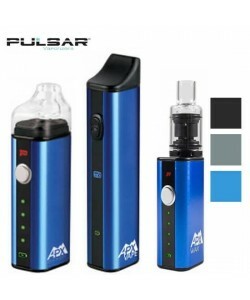 It has a blue, LED back-lit button that you press in order to engage the battery and begin vaping right away. After you have drained the battery, you can charge it using a standard micro-USB port that attaches to the bottom. This simple vape pen also comes with overcharge protection to ensure that the battery lasts as long as possible and includes a lockable system to secure it during your travels. The Cloud Pen 2.0 is the next wax vaporizer that follows in the footsteps of its predecessors. This wax only vape features a battery that is almost twice as powerful as the Cloud Pen 1.0 and has a rating of 650 mAh. Instead of using a single coil rod atomizer like the 1.0, the Cloud Pen 2.0 takes advantage of both single and dual titanium coils inside a ceramic chamber. Ceramic and titanium allow for cleaner, tastier vapor than the 1.0. The Cloud Pen 2.0 features a longer drag time than the 1.0, with 25 seconds of pulling to extract the most vapor possible. The heat up time is just as swift so it only takes 5 seconds to warm to the right temperature. The Cloud Pen 2.0 still features a matte black finish, but the LED light on the button is a crisp white color instead of the blue found on the 1.0. This ultra small and compact portable vaporizer is just as simple to vape and charges on the go using its micro-USB port. While the Cloud Pen 3.0 takes advantage of the same 650 mAh battery as the 2.0, the engineers have stepped up their game with this vaporizer! The Cloud Pen 3.0 includes multiple atomizers suitable for waxes, oils, and dry herbs respectively. These atomizers click right into the battery and include a dual-coil atomizer for concentrates, one ceramic rod atomizer, a dry herb atomizer, 1 Medi A2.0T Atomizer for oils, and a Cloud Atlas 1.0 glass globe with atomizer base as well. These atomizers are all exceptionally powerful and produce robust flavor and clouds. Like the earlier models, the Cloud Pen 3.0 vape pen has a swift heat up time of 5 seconds and gets its charge using a standard micro-USB port. It has the same drag time of 25 seconds like the 2.0, but this vaporizer features a metallic gold finish with a yellow LED back-light. Black and gold look beautiful together, but no one will see this design unless you want them to, thanks to its compact design. ***Use VP5 coupon code at check out to save even more on any of the vaporizers descibed on this page. The Cloud Pen OG kit comes with two complete vaporizers, allowing you to load up two different kinds of waxes and never worry about changing atomizers. The Cloud Pen OG is a versatile creation, putting control in your hands. These Cloud Pens are great because they have click-in atomizers for swift changing. Using 350mAh batteries, these portable vaporizers are sleek and slender, making it very simple to take on the go. All black color, featuring a drag time of 20 seconds for a nice, slow, flavorful vapor. LED lights indicate when the battery is charged and when it has been depleted. Red indicates that the battery life is less than 10%. When leading a busy life, it can be hard to remember to take all of the things you need to make dabbing a breeze on the go. You've got to grab all of your tools and accessories, and you have probably forgotten something more than once while in a hurry. The Cloud Pen team aims to change all of that by introducing this powerful new Paragon vaporizer that has everything you need to vape on the run. The Cloud Pen Paragon is a portable vaporizer in every sense of the word. With it, you no longer need to worry about bringing along your favorite concentrates in their little silicon jars, because this portable vape has taken care of that for you. Included inside, on the bottom of it, the Paragon Vaporizer has a built-in storage jar that is nonstick to ensure that your waxy materials come out cleanly. This container rests in the bottom of the Paragon creation for your convenience. It also features an innovative dabbing utensil integrated right into the vape to allow for super simple loading. Along with the insane convenience and portability of the Cloud Pen Paragon, you will be receiving a real powerhouse! This device lets you take advantage of all of the ferocity behind two top quality dual quartz rod atomizers. Quartz provides an incredibly clean, fresh taste with no dilution like you might experience with certain metals or a wick system. This way, you can vape your concentrates the way they were meant to be vaped - pure, crisp, flavorful, with potent draws every single time. This vape also features an air control valve to further improve the taste of your wax materials. The Cloud Pen Paragon vaporizer uses a strong 2200mAh battery that can deliver up to 3 different temperature options and fits on any tank or mod, plus it can be fully charged in only 3 hours; however, if you do not want to wait, this battery features a pass-through technology that lets you vape as you charge! The Paragon vaporizer was intended to introduce features that had never been seen before. It was the first of its kind to have a No Goo Silicone jar built into it for storing your sticky concentrates. It also comes with an airflow valve so that you can choose your level of draw resistance. With three temperature settings, a huge chamber, and dual quartz rod titanium coils, this is a true game changer. The aforementioned No Goo Silicon Jar that is built in, is perfect for those who often forget their containers when they leave the house. It also just serves to make it more portable as there are fewer accessories that you need to carry around with you.Cloud Pens Paragon dual quartz rod atomizers mean that you can really enjoy the flavor of your concentrates that you carry along with you, as quartz provides a clean, crisp flavor. The air control valves further that enjoyment, as you can adjust the airflow to your precise liking. Coupled with its 2200mAh battery, you can have hours of long-lasting enjoyment, and when it dies, simply plug the vaporizer pen in and enjoy the pass-through vaping technology! If you prefer to vape only dry herbs and aren't a fan of concentrates, CloudPens still has you covered. The Cloud Pen Chloris is a remarkable step up from the Cloud Pens before it. While it only vapes dry herbs, this vaporizer features a temperature control range of 350 to 430 degrees Fahrenheit, something that the 1.0, 2.0, and 3.0 lacked. As they could only use one optimized temperature, but with the Cloud Pen Chloris, you can choose your own with the help of the buttons on the device and the digital OLED display. This feature allows to heats the ceramic heating chamber to perfection. While the other vaporizers use a 350-650 mAh battery, the Cloud Pen Chloris uses an incredibly robust, powerful 2200 mAh lithium polymer battery that can last through even the longest of sessions. Chloris also features a 60-second heat up time which is a bit longer than the other vaporizers, but its unique memory function and its five-minute safety shut-off make it well worth the short waiting period. Coupled with its ability to charge using a micro-USB port, this sleek, slim, and compact vaporizer can go anywhere you go. The Cloud Pen brand offers a one-year warranty on some of their products. If you receive a defective atomizer and haven't used it, they will swap it out within the first 30 days of purchase. The micro-USB lithium-ion batteries also feature a 12-month warranty if they are defective. The product warranty only covers defects in the materials or a defect in the manufacturing. Issues related to normal wear and tear or theft are not covered, nor are damages from accidents, abuse, or modifications. In conclusion, Cloud Pen team has made a name for themselves in the vaping industry with their compact, sleek, and portable models. They put all of the cleanliness and flavor one gets from a tabletop unit into a portable vaporizers with atomizers that outshine most others in the industry, to save you time and deliver the utmost convenience. Its thoughtful and innovative jar feature helps further the portability and convenience with its Paragon vape, and if this isn't enough, they offer a line of other vaporizers that you can choose from to suit your needs and preferences. There really is a Cloud Pen vape out there for everyone, including you. Yes you! The Cloud Penz line is top notch, their product line offers the perfect model for a variety of different users. Compact, easy to charge, and even easier to use, the Cloud Pen vaporizers are perfect for those who enjoy vaping on the go. Easy to clean and use - Review by Janet R.
The Cloud Pen Paragon is really easy to clean and easy to use. I love the three different temperature settings that it offers me. The vapor is awesome, too! Easy to use - Review by Matthew B. The Cloud Pen 2.0 is so easy to use that I wonder why I have never given vaping a shot before. I love how the vapor tastes and that it is really easy to hide when I take it with me places. Well priced - Review by Nancy H.
The Cloud Pen 3.0 is a great value for the price that is being asked. I love how easy it is to use and it is really easy to clean with the tools that come with it. Smooth to inhale - Review by Anna M.
I recommend the Cloud Pen Paragon to novice and expert users alike. It is so smooth to inhale and packing the chamber is easy and takes no time at all. There is nothing bad to say. Beautiful vape - Review by Marco A.
I fell in love with the Cloud Pen Paragon as soon as I opened the box. It is really beautiful to look at and feels great in my hands. All of the different temperature settings give me really great flavor and a nice vapor production. The only downsides to the Cloud Pen Paragon is that the battery is not removable or replaceable. Well done - Review by Carmen T.
This vape is the only vape I plan on using anymore. Quick, easy and to the point. Fast shipping - Review by Patrice M.
It is really effective and gentle on my throat even though it produces a lot of vapor. I am really happy with my purchase. Compact - Review by Amy P.
I love it. It is very convenient to use and clean. Cloud Pen 2.0 is so portable that I sometimes worry I will lose it. 10/10 - Review by Arthur B. This was the first vape I have ever tried. Paragon gave me a really great first impression as it does exactly what it was advertised to do. Looks great, I got it in dark blue and still enjoy the color after 4 months. The use of it simple, load, click, and vape. The vapor taste is the bonus, when compared to smoking, with this you can actually taste it. I mostly use it on the go, so the one time hitter style is a plus for me.